Shields can be difficult to breach with transporters when they get shot down, then come right back up again. An opportunity should be created to beam aboard. When shields are reduced to zero by damage, they become disrupted for 20 seconds. This is per side on spacecraft. The visible appearance of the shield bubble changes. On spacecraft, the visible appearance of the disrupted side changes. Disrupted shields do not block moving objects or weapons fire. Disrupted shields continue to charge as usual. Disrupted shields do not block transporters. On spacecraft, transporters are not blocked if any side is disrupted. Military HQ is supposed to protect civilian buildings from destruction. Military HQ is supposed to be protected from destruction by military buildings. On a world with a military HQ, civilian buildings can no longer be destroyed. They can be damaged down to zero hits points and lit on fire. They just won't go the final step to being destroyed. A city or base with heavily damaged buildings will incur a -1 morale penalty. A city or base with burning buildings will incur a -1 morale penalty. Buildings that are heavily damaged or burning do not run any manufacturing processes. Military HQ is similarly protected from destruction while any non-HQ military buildings exist on the world. Non-HQ military buildings are not protected from destruction. After they are destroyed, the HQ can be destroyed. After the HQ has been destroyed, civilian buildings can be destroyed. Instead of destroying cities, a conquerer could destroy the existing military base, then build their own base, to take control. Damaged buildings (civilian and military) are repaired slowly, using construction materials available in their community. Buildings only require their basic construction material to be repaired, i.e. lumber, stone, metal. Who imports them at a base? In order to insure bases have repair materials, military HQ, military dock, and military air terminal now import basic construction materials. Retail stores do this in a city. Not new, just fyi. It is conceivable that a shield bubble could be large enough to extend outside the atmosphere. The shield bubble is now offset downward to keep the top of the shield bubble inside the atmosphere. This could result in a strange situation if a very large shield bubble is built on a ringworld or small world, where the bubble might get pushed out the back side. The radius of the bubble at shield bases is determined by the shield equipment volume. Shield equipment volume also determines the size of the shield capacitor. This makes it difficult to make a strong shield that is small in size. Shield base now augments its shield power using its battery. This allows increased energy absorption without changing the diameter, which is still determined by the shield equipment volume. There is a slight difference between the two stores of energy. The shield is recharged every ten seconds, by taking as much power as needed from power plants. The battery is recharged more slowly, by taking 60 units of power once per minute from power plants. Shields absorb 10hp of damage per unit of energy, adjusted for shield module quality. The values shown for shields on the analysis reports are meaningless now that shields are no longer treated like armor. Analysis reports for spacecraft and buildings now show the amount of hit points absorbed by shields, per side for spacecraft. There is no longer any difference between the combat effectiveness of the shield modules. I will likely nerf the kinetic shield module. The cloaking shield still has potential. The analysis reports for buildings show they have no armor, even when I dial up the armor. The hull module data that was added for buildings did not define any armor factors. They are there now. This fixes all existing buildings; they don't have to be rebuilt. The hit points on new style buildings and spacecraft are quite large. Hit points on buildings and spacecraft were reduced by a factor of 10. This will not affect existing spacecraft and buildings, only new ones built after this change. There are a few places where armor resistance is reported vs kinetic and vs energy damage. What does it mean? This is confusing. Armor is now only reported as a single generic value, based on contact weapon mode with no specific weapon effect. Actual armor effectiveness varies based on weapon mode and effect. Armor resistances against every combination of weapon mode and effect are not reported; it is too much information. Armor resistance cannot be usefully organized into categories like kinetic or energy. This looks like a fun update, it's great to see the counterpart to cities slowly come together. I have one suggestion though, and that's that ship hp should remain as it was without being reduced. The most ships I've ever seen in a single battle was 13, when Tesco and Syndicate were fighting, and that was both sides combined. All of those 13 ships together against potentially 400 military buildings (Each of which can dedicate far more space to weapon bays) couldn't do anything, even if they were Q255 new style ones. It'd feel a bit more fair if the HP factor was retroactive to existing designs. By the time I match quality with other empires, I'll need ten times the ships to match their older fleet. I like the change though, and everything else this update brings looks pretty fun. The shield stuff is looking really good! Nice work. Another question: if my ship is inside your shield bubble, or even just my transporter pad, does that allow me to board you? Could be a worry for ships at anchor, but it is a nice touch of consistency. Perhaps shields totally disable enemy transporter pads inside them, so if you land your ship at an enemy city you cannot transport out of the bubble, either. I'm not sure what to think about the hitpoints. The largest possible ships, as Mortius says, will not be able to do much against heavily fortified planets (since their weapon power hasn't been reduced). Consider this, too: every hit on your ship has a chance to reduce system effectiveness, including weapon effectiveness. Up to 400 enemies are focusing fire on you. But you can only fire on a handful of them at once. Even if your weapons' power is enough to destroy each building's hp 10 times over in a single hit, you're limited to reducing their weapons output by 1/400th. You can never do more than that in one shot, no matter how big your gun is. Meanwhile, you could be losing huge chunks of your own capability every second. Defence now seems to have an unreasonable advantage, particularly since the game encourages small numbers of ships while not discouraging vast numbers of weapons bases. And that's on top of the defensive space station, which can have the same hull volume as you, but doesn't have to waste much on fuel, engines or ftl. A flat 10x reduction also worries me. The smallest starter ships were already made of tissue and are probably too weak to small-arms fire now. If there must be a reduction (which I'm not sure of), perhaps make it non-linear? Even a slight buff to shuttle-sized ships? As Vwhatgoes says, certain players already have 4+ billion hp ships in play. That's not going to be very fair, one way or the other - especially since they can be infinitely recalled, and recalling now takes only a fraction of the time it did when they were designed. Most grandfather clauses rely on their exceptions not being endlessly reincarnated! We might have coped with one, but we would have been a little disconcerted if the Bismarck had popped up again the following Tuesday. My old battleships could kill a new Q255, max-armour & max volume ship in just four shots, if the dice are with them. In Star Trek the balance always seems to be that, faced with an overwhelming enemy, you can take about 4/5 hits before shields go down, 3/4 hits after that till you die. Just from a narrative point-of-view, that feels about right. Good tension. Might be a reasonable baseline? E.g., no capital ship should be one-shotted. Biggest weapon in the game should kill you in c.10 hits? That's time enough to warp if you're quick; but it wouldn't be easy and you might take a critical or disabling hit first. It's really hard to know how much shields will help without knowing their recharge rate. Dedicated anti-planet weapons. Perhaps a ship can use the planet's predictable movement and gravity to use ultra-long range explosives against it. Such a ship would be able to sit out of reach of orbital defences and bomb them down. But it would be a very slow process, perhaps taking several days for a moderate-sized defence base, and a great deal of hull volume would have to be used to make the weapon effective. If defending fleets arrived in time, the bombardment ship would not have the right weapons to defeat them - it would be outfought in every way. So, ordinary ships would have trouble with planets: invasion would have to be a deliberate and dedicated affair: you couldn't just run around in your personal flagship conquering everything. But when you did put in that dedication, you'd have a reasonable chance. Such a division between bomb-ketches and ships-of-the-line might add an interesting layer to war play. It might incidentally alleviate the problem of being invaded while you're asleep or at work. Ordinary ships might have to defeat any space stations before your bombards could move in. EDIT: Ikkir made the point that small craft might become more important. If their weapons are beefed up with the update, and if NPCs gain the ability to pilot them, I can see carriers becoming exactly the sort of anti-planet weapon I describe - the mothership stays out of range. More fun too. But in that case, it would still be nice if carrier ships had some sort of trade-off against direct firepower. Perhaps you have to allocate significant volume to support facilities for each flight crew; which would still allow you to have as many vehicles as you like for personal use (as is currently the case). I will make the hp change retroactive to existing ships. Shields guard against all incoming transporters, regardless of where they originate. That's probably a good choice, in the end. We'll miss our monsters, to be sure. 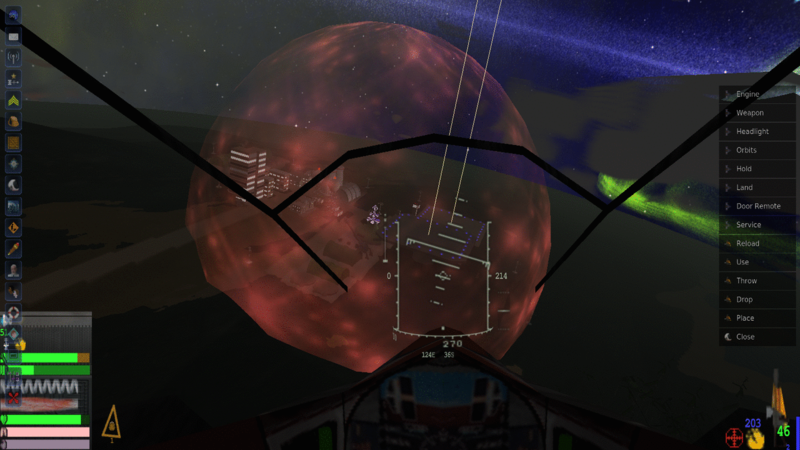 Do you have any thoughts of your own about balancing orbital combat? I guess it's a huge topic that will take lots of time to get right. Perhaps we ought to do more testing in-game. Given the ability to spam turrets, I suppose I would still slightly lean towards bombardment weapons over fighter combat, but it will be interesting to see how the vehicle update changes that balance. Is it actually your intention that a small number of ships should not be able to breach a reasonably defended planet, without special tactics? I think that could make for pretty entertaining (and fairer) gameplay, if handled right, I'm just interested to know if it's what you're going for at the moment. Presently I am going for getting everything working. (07-13-2018, 06:59 PM)Haxus Wrote: Presently I am going for getting everything working. Certainly a good place to start. Battle mechanics can be tinkered with once the engine is fully functional.